Safe Step® Extreme Calcium Chloride melts to -25°F and begins melting on contact. It consists of high purity, 100% Calcium Chloride melts ice at the lowest temperatures! It leaves no powdery residue. It is safe for use on concrete that is at least one year old. 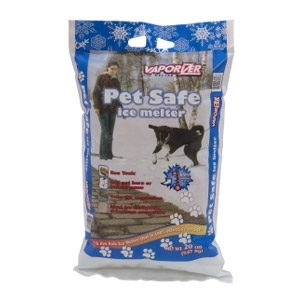 Safe Step® Extreme melts ice to temperatures as low as -15°F. 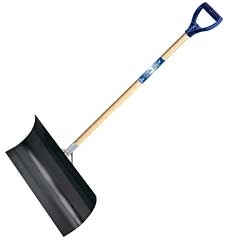 It begins melting on contact and is safe for pets, concrete and vegetation. It is safe on concrete that is at least 1 year old. Safe to handle and will not harm skin which means there is no requirement to wear gloves and goggles. 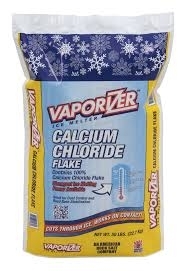 Vaporizer® Calcium Chloride Flakes contain 100% Calcium Chloride. It is the strongest ice melting power available. It cuts through ice, and works on contact. It is also great for dust control and road base stabilization. Melts to -30°F! 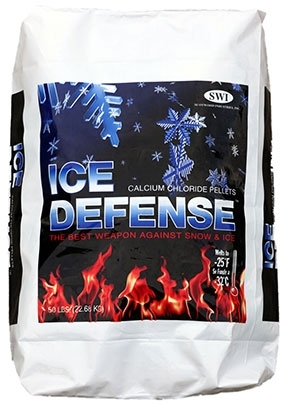 Ice Defense™ Calcium Chloride Pellets are the "Best Weapon Against Snow & Ice." Melts snow and ice 2-5 times faster than rock salt and other blended ice melters. Will NOT Chemically Attact Concrete, Asphalt, or Plants. 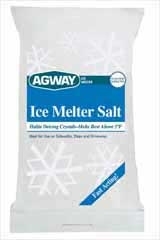 Agway Halite Ice Melter Crystals feature a unique sizing mixture of both large and small cystals of sodium chloride. It is a natural, mineral rock salt. 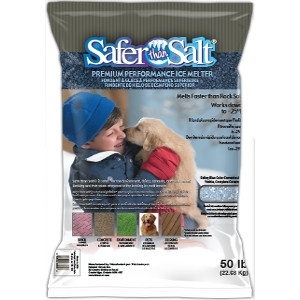 The Original and the #1 Pet and Child Safe Ice melter for over 20 years. Guaranteed environmentally safe – 100% salt and chloride free, guaranteed non-corrosive to all metals and non-conductive will not short out circuits. Nontoxic for animals and humans, safe around children and pets. Will not harm waterways and sensitive wetlands. Works to a low temperature of -2°. 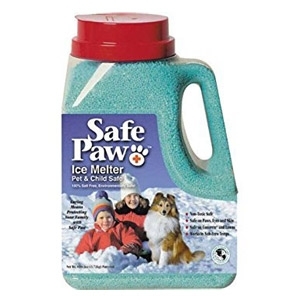 No other ice and snow melter works like Safe Paw – It is totally unique. 8 lb. jug. The formula does not generate heat. Will not burn or irritate paws. Our environmentally friendly formula is safe for pavers, concrete, and asphalt. 100% screened salt. Best value – cost vs. coverage. Magnesium, Calcium and Sodium blend. Vaporizer’s highest concentration blend of Calcium & Magnesium within the product. Professional product with superior melting power in sub-freezing temperatures. Product is colored for enhanced visibility of application. Vaporizer’s highest concentration blend of Calcium & Magnesium within the product. Professional product with superior melting power in sub-freezing temperatures. Product colored for enhanced visibility of the application. 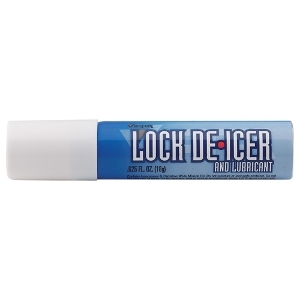 This Aerosol, Lock De-Icer, thaws frozen locks of automotive (car & trucks) doors as well as any outdoor and household lock. It also prevents the lock from re-freezing and rusting. A unique blend that melts down to -15 Degrees Fahrenheit. It is safer for the environment, bricks, concrete, asphalt, pressure treated decking, and pets paws. 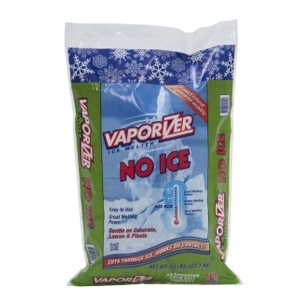 Fast-acting and longer lasting ice melter that requires less to melt more. Also available in a 10lb Shaker Jug. 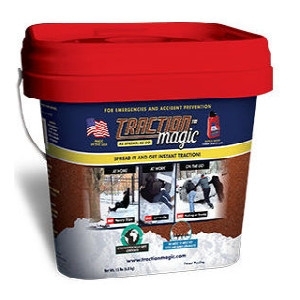 Traction Magic® is the only traction agent that works instantly, It could be used when your car is stuck, when you need to walk on walkways, driveways or decks.